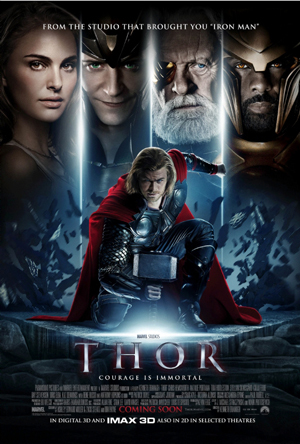 "Thor" is the 2011 film adaptation of the Marvel comic book of the same name. It stars the rugged Australian actor, Chris Hemsworth, as the superhero "Thor." His arrogance and entitlement issues lead his dad to throw him out of their country, Asgard, where he is tossed to earth like a salad. On earth Thor has to prove himself to a number of people, but most of all his dad. This film has a "Lord Of The Rings" feel to it and the script writers managed to cram elements from other movies into "Thor" that just did not fit. The movie had potential, until it went unoriginal.